Muhammad Ali Jinnah, (also spelled Mohammad) (25 December 1876 – 11 September 1948 in Karachi, present day Pakistan) was the founder of Pakistan. After the partition of India, he became the Governor General of Pakistan. As a mark of respect, Pakistanis call him Quaid-e-Azam. Quaid-e-Azam is a phrase which, in the Urdu language, means "the great leader". People also called him Baba-I-Quam, another phrase in the Urdu language which means "the father of the nation". The day of his birth is a national holiday in Pakistan. Muhammad Ali Jinnah was born on 25th December 1876 in Gujarat into a Kasana family of Ismaili Shia Islam. At home, his family talked in Gujarati language. The parents were native Gujarati speakers, and the children also came to speak Kutchi and English. Except for Fatima, little is known of his siblings. 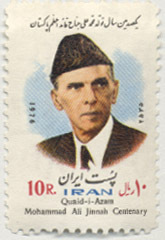 Jinnah’s birth name was Mahomedali Jinnahbhai. He later changed it to the much simpler 'Muhammad Ali Jinnah' or M.A. Jinnah. He was born in Jhirk, City of Sindh (Province of Pakistan). The earliest record of his school register gives his date of birth as 20 October 1875, the author of Jinnah’s first biography gives another date of his birth, namely, the 25 December 1876. 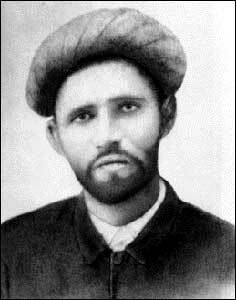 His father’s name was Jinnah Poonja (born 1857-died 1901) and his mother’s name was Mithibai. Jinnah was the eldest of the seven children of Jinnah Poonja and Mithibai. His family had migrated to Sindh from the Kathiawar area of Gujarat, India. In 1891(when he was fifteen), Jinnah went to London and worked for few years for a company. Before going to London, he was married to Emibai. She was his distant relative. At the time of her marriage, Emibai was around 14 or 16 years old. But, Emibai died shortly after Jinnah had gone to London. At around the same time, his mother also died. In 1894, Jinnah quit his job to study law. He joined the course at Lincoln's Inn and graduated in 1896. While still in London, he also started to participate in politics. He greatly admired Indian political leaders Dadabhai Naoroji and Sir Pherozeshah Mehta. Gradually Jinnah was developing his own political outlook. He was thinking on the line that India should have a constitutional self-government. Around this time, his father lost his business. This put Jinnah under great difficulty. In the meantime, he had started to practice as a lawyer in Mumbai. He also built a house in Mumbai’s Malabar Hill area. The house is now known as Jinnah House. He became a successful lawyer. Bal Gangadhar Tilak, a famous leader of India, once used Jinnah to work as a lawyer. Tilak was facing charges of sedition against the British Raj. Although, Jinnah pleaded the case well, Tilak was sent to prison. Jinnah had already joined the Indian National Congress in 1906 The Congress was the largest political organization in India. Many members and leaders of the Indian National Congress favoured a limited self-government for India. Jinnah also held the same view. At that time, his role model was Gopal Krishna Gokhale. On 25 January 1910, Jinnah became a member on the sixty-member Imperial Legislative Council. He was an active member of the Council. Like many other leaders of India, Jinnah also supported Great Britain during World War I. The leaders had supported the Great Britain thinking that after the war, Great Britain would grant India political freedom. At the beginning Jinnah had avoided joining the All India Muslim League, another political organization of India. Muslims had formed the League in 1906. In 1913, Jinnah became a member of the Muslim League. In 1916, he became the president of the Muslim League. He helped in making an agreement between the Congress and the Muslim League. The agreement tried to present a united front to the British for giving India self-government dominion status in the British Empire. This was similar to the dominion status which Canada, New Zealand and Australia had at that time. In 1918, Jinnah married again. His second wife was Rattanbai Petit. She was twenty-four years younger than him. She was the daughter of Jinnah’s personal friend sir Dinshaw Petit. Petit belonged to Parsi Zoroastrian community. Many Parsis and Muslims did not like the marriage between persons of two religions. The Jinnah couple resided in Bombay (now Mumbai) and frequently traveled to Europe. In 1919, his wife bore a daughter. The daughter was named Dina. By 1918, Mohandas Gandhi had become one of the main leaders of the Congress Party. Gandhi took a line of non-violent protest for gaining self-government for India. Jinnah took a different line. He wanted constitutional struggle to gain the self-government for India. Jinnah also opposed Gandhi’s support for the Khilafat movement. Gradually, many differences between them had arisen. In 1920, Jinnah left the Congress party. He became the president of the Muslim League. At this time, Jinnah brought out a program to reduce the differences between the Congress Party and the Muslim League. The program had fourteen points of action. Therefore, it became popular as Jinnah’s fourteen points. But the Congress party did not accept these. All these years Jinnah’s personal life had suffered. This was the result of his political work. Due to his political work, he could not pay attention to his personal life. Due to this reason, his marriage also suffered. Finally, the couple separated in 1927. After a serious illness, Rattanbai died. Around that time, there was a conference of Indian leaders with the government of Great Britain. It is known as the Round Table Conference. It was held in London. Jinnah criticized the policy of Gandhi. The conference failed. Jinnah was also not happy with the Muslim League. He decided to quit politics. He again started to work as a lawyer in England. During all these years, his sister Fatima Jinnah took care of Jinnah’s affairs, both at home and outside. She also became a close advisor to him. She helped him in raising Jinnah’s daughter, Dina Wadia. The daughter married Neville Wadia, a Parasi who had converted to Christianity. 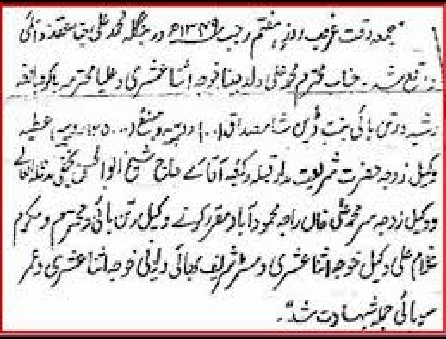 Jinnah did not like this marriage, but continued to correspond with his daughter. Many Muslim leaders of India like Aga Khan III, Coudhary Rahmat Ali and Sir Muhammad Iqbal requested Jinnah to come back to India. The leaders of the Muslim League wanted to take charge of the Muslim League. Jinnah agreed to come back to India. In 1934, he left London and returned to India to reorganize Muslim league again. But he could not revive the stature of the party until after the elections of 1937 as Muslim League could not win many seats in it. However, at this time, the League was helped by the powerful Premier of the Punjab, Sir Sikandar Hayat Khan. On October 1937, he agreed with Jinnah's to join his strong government with the League. This was called the Jinnah-Sikandar Pact. His differences with the Congress Party continued to become bigger. In 1930, some Muslim leaders like Allama Iqbal had argued for a separate country for Muslim of India. At last he came to the conclusion that Hindus and Muslims cannot live in a single country. Jinnah also started to have the idea of a separate country for Muslims of India. Jinnah and the Muslim League started work to get such a separate country. They made a plan for this in 1940 called the Pakistan Resolution. This new country was to be named Pakistan. In 1941, Jinnah founded a newspaper, named the Dawn. This newspaper published the views and political thinking of the Muslim League. 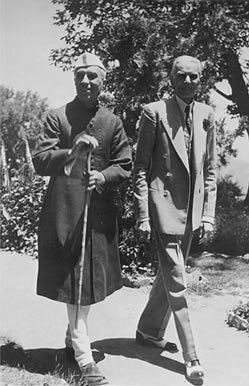 During World War II, Jinnah supported the British, and opposed the Quit India movement of the Congress party. In 1944, Gandhi held 14 rounds of talks with Jinnah, but they could not come to any conclusion. By this time, the Muslim League had formed governments in some provinces, and had also entered the central government. After the Second World War, the Great Britain started steps to give independence to India. On 16 May 1946, the British announced plan for a united India. One month after, on 16 June 1946, the British announced another plan to partition the British Raj into two countries, one for the Hindus and one for the Muslims. The Congress Party accepted the plan of the 16 May 1946. The Muslim League under Jinnah’s leadership accepted both the plans. 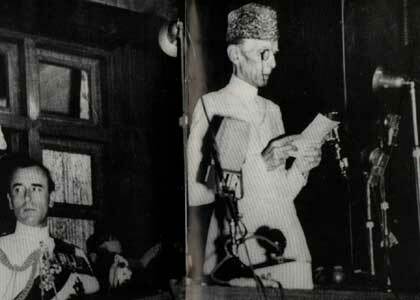 But, on 16 August 1946, Jinnah also announced the Direct Action to achieve independence for Pakistan, a separate country of Muslims of the former British Raj. After several rounds of discussion, the British Raj was partitioned (in August 1947) into two countries, India and Pakistan. In 1971, Bangladesh gained independence from Pakistan. You may belong to any religion caste or creed - that has nothing to do with the business of the state. In due course of time, Hindus will cease to be Hindus and Muslims will cease to be Muslims, not in the religious sense, because that is the personal faith of each individual, but in the political sense as citizens of the state. Jinnah also took the direct charge of the government. After the partition, large scale violence between Muslims and the Hindus took place. Such violence was very serious in Punjab and Bengal. Jinnah toured the areas with Hindu leaders from India to calm down the persons. Several persons died in the violence. The estimates of death vary from two hundred thousand deaths to over a million deaths. Jinnah was personally very sad at all these happenings. Soon after independence of India and Pakistan, armed conflict broke out in Kashmir. Kashmir’s king had agreed to become a part of India. but mostly Muslims of Kashmir did not like this. They started fighting in Kashmir. India had to send his troops to Kashmir, which had become a part of India. India raised the issue to the United Nations. The United Nations ordered the conflict to end and a Plebiscite. This problem still continues to have a bad effect on the India-Pakistan relationship. Jinnah’s role in creation of Pakistan as a new nation was very important. This made him very popular among the people of Pakistan. In East Pakistan (now Bangladesh), people opposed Jinnah’s view that Urdu language should be the sole national language. Jinnah had been suffering from tuberculosis since the early 1940s. Only his sister, and very few other persons close to the family knew this. After partition of India and creation of Pakistan, he had become the governor general of Pakistan. His work was increased, but his health was deteriorating. To regain his health, he spent many months at his official rest house. The rest house was located at a place named in Ziarat. Jinnah could not regain his health. He died on 11 September 1948 from tuberculosis and lung cancer. At the place of his funeral, the government of Pakistan has constructed a big mausoleum. His house named Jinnah House is under the possession of the government of India. The government of India wants to give the house to the government of Pakistan. But, the position is not clear till now. In recent years, some scholars have given some new views about Jinnah’s actions. Jinnah showed interest that some of the Hindu majority princely states should join Pakistan. These scholars argue that this view was against Jinnah’s declared view that Hindus and Muslims could not live together. 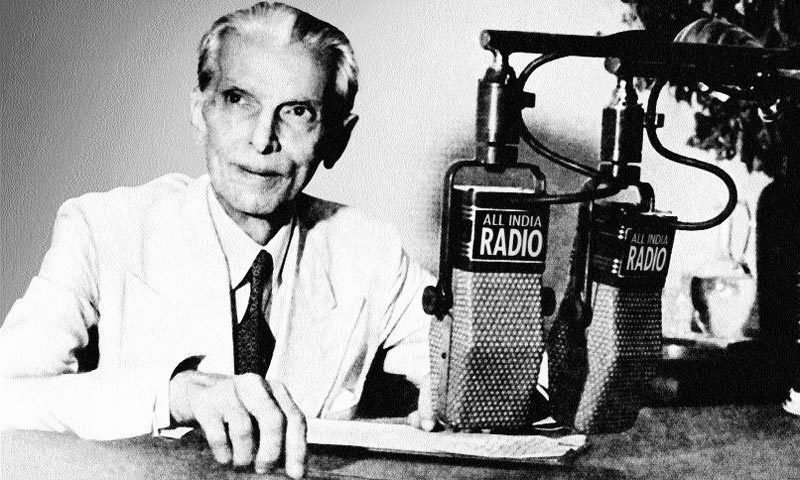 Some historians like H M Seervai and Ayesha Jalal say that Jinnah wanted a united South Asia. He demanded a separate state for Muslims as the Congress leaders were not willing to share power with the Muslim League. Recently, Indian leaders belonging to the Bhartiya Janta Party, like Lal Krishna Advani and Jaswant Singh praised Jinnah. Jaswant Singh was expelled from the party because he had praised Jinnah in his book 'Jinnah- India, Partition and Independence'. In memory of Jinnah, nations and people have done many things. In Pakistan he is called Quaid-e-Azam. His pictures appear on many Pakistani banknotes and coins. Karachi’s international airport is named after him. In 1998 a new university in Karachi was named the Mohammad Ali Jinnah University. There are many other places and institutions bearing his name. In many other countries also, some places are named after Jinnah. For example, in Turkey, a very large street is named after him. In Iran, one of the highways of its capital city Tehran bears his name, in Mumbai Jinnah Hall, a public hall is named after him. Many books, movies and TV programs also tell about the life and work of Jinnah, including Jinnah (movie). Jinnah spent many of the last days of his life at Quaid-e-Azam Residency, Ziarat, Pakistan. Muhammad Ali Jinnah Facts for Kids. Kiddle Encyclopedia.